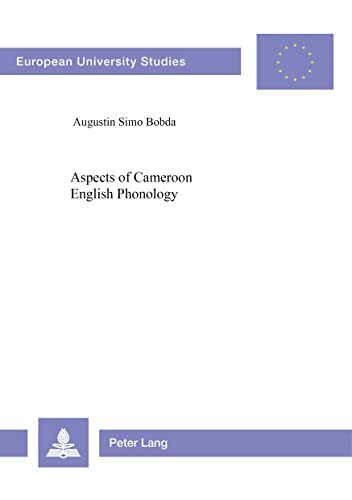 Cameroon English (CamE) phonology has already developed into a quasi-autonomous system. Thousands of segmental and stress deviations from native English reach, or approximate to a frequency of 100%. Analysed from a generative perspective, the deviations are shown to derive from the fact that certain Received Pronunciation (RP) rules do not apply in CamE while others apply differently, partially or more generally, and still many others are typically Cameroonian. One of the major proposals of the book is the concept of Trilateral Process which consists of RP phonological processes symbolized by a side AA', the restructuring of the RP underlying representation (UR) into a CamE UR by AB and CamE phonological rules by BB'. The concept is applicable to other non-native Englishes. The Author: Dr Augustin Simo Bobda was born in Bayangam (Cameroon) in 1952. Senior Lecturer in English Language at the Ecole Normale Supérieure, University of Yaounde I. Author of numerous articles on English phonology, lexical and grammatical usage and English language teaching. Co-author of An Introduction to Spoken English (University of Lagos Press, 1993).